What a little warm weather will do! 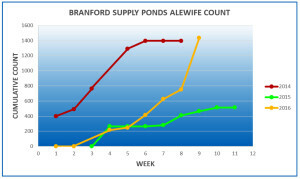 The Supply Ponds fishway recorded 680 fish last week – nearly equal to all the fish counted in the preceding five weeks! In, fact, with this week’s run, our total-to-date of 1,433 fish has now surpassed the 2014’s total for the entire season. Elsewhere in the state, the alewife run appears to ending, or is over, while the blueback herring run is getting into high gear. 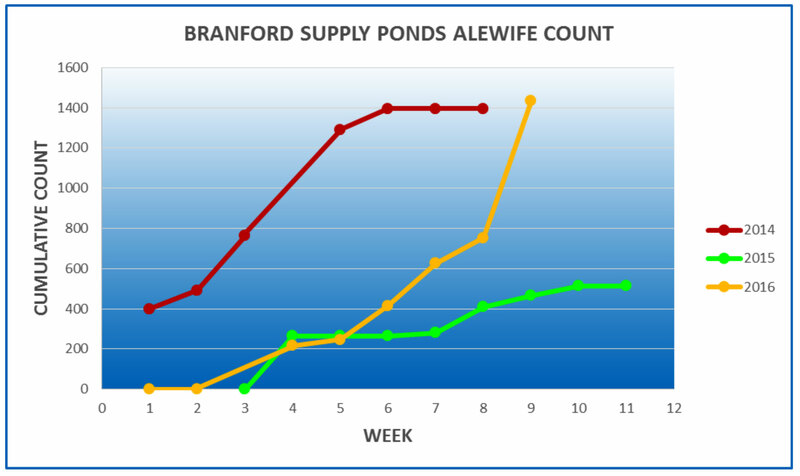 So we shall see what the next couple of weeks bring to the Supply Ponds. If you are curious about why alewives matter, what we can learn from them, and what global climate change might mean for the species (and for us), I encourage you to watch the short video from Yale University’s David Skelly and David Post, “Evolution and Climate Change: What Wood Frogs and Alewives Can Tell Us.” (Dr. Skelly presented a lecture on his work with wood frogs at the BLT Annual Meeting on May 25).